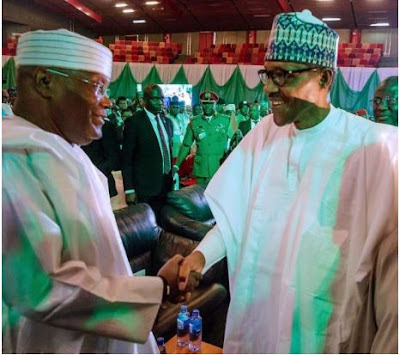 President Muhammadu Buhari, candidate of the APC, and former vice President Atiku Abubakar, candidate of the PDP, on Wednesday shook hands at the second peace accord aimed at having a peaceful presidential election. In the same vain, Atiku said like former President Goodluck Jonathan, his ambition is not worth the blood of any Nigerian. Patricia Scotland, the secretary-general of the Commonwealth; Mathew Kukah, Bishop of the Roman Catholic Diocese of Sokoto, as well as other members of the National Peace Committee (NPC), were in attendance. Yakubu Gowon, former head of state, was also present at the ICC to witness the historic event.